Over two and a half years ago I decided that I was going to see a total eclipse after listening to a physics podcast about them. 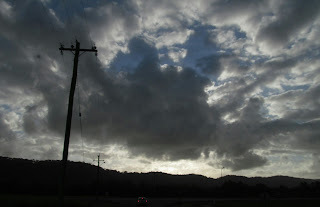 Two years ago I found out that the next nearest one to me would be in Cairns in 2012 and booked a spot on the lawn of Elizabeth's aunt's tropical fruit winery in Shannonvale near Port Douglas, smack bang in the middle of the path of total eclipse. (They actually let us use their caravan). Our planning for our year of discovery had to take us to this spot on November 14th. 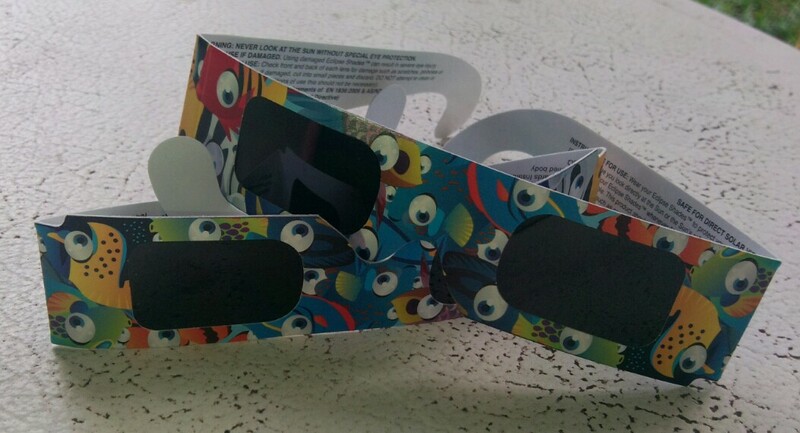 So it was with immense excitement and expectation that we drove through Cairns on the 12th of November only to find out that they had run out of eclipse viewing glasses. The next day in Mossman the same thing occurred: totally out of eclipse viewing glasses. It was not until 6pm on the 13th that we found some glasses left in the tourist office of Port Douglas. Whew, ready to go. The weather forecast that night was giving us a 50/50 chance of a clear sky for the eclipse starting at 5:44am with totality occurring at 6:38am. I set the alarm for 5:30 and went to sleep. I woke at 5 and could not get back to sleep. We grabbed the camera, some coffee and drove down the road to a location where we could see the sun (the winery was too low). Clouds were in the sky but initially the sun was clear. As the time drew near the clouds closed in and things were not looking too good. Then with minutes to go the sky around the sun cleared. We stared at it with our eclipse glasses, watching the moon eat away at the final pieces of the sun. As totality approached I took off my glasses and looked behind me. The last remaining rays of the sun were casting an eerie contrasting glow on the landscape. Near night time darkness washed over the landscape within seconds. I was surprised at how quick it was and how cold it suddenly got. I checked my phone, 6:38 plus a few seconds, it is at this time you can look directly at the sun. I turned around and was awestruck at the sheer size and amazing beauty of the eclipsed sun, with easily visible flames licking out from the outside of the moon valiantly trying to contain its power. You always think that pictures are enhanced of eclipsed suns - special filters, equipment, timing etc - but not so; it was as you see it in my picture using an average digital Canon camera on automatic with the only adjustment being an override of 2 f stops under-exposed. I was interested in hearing if the animals and birds went quiet but I completely forgot to register whether that happened at all as I stared at and photographed the eclipsed sun for the full two minutes (and a few seconds). Minutes later clouds started moving in again, and over the next hour the sun would come out intermittently and we would rush to put on our glasses to have some final looks. This was truly an amazing natural event and I am so glad that I put in the two years worth of planning and effort it took to get me here and that the clouds and the location randomly worked in my favour. Many people were not as lucky; places in Cairns stayed clouded over and apparently in Port Douglas on the 4 Mile Beach half saw the total eclipse unimpeded while the other half of the beach was clouded over. Thanks Tony and Trudie for letting us stay in your caravan and for the brilliantly quiet and secluded location where we were on our own as we witnessed this little cosmic miracle. How to break the Iceland aye? Get it? Sorry mate, never seen a total eclipse in Perth, I think that was a partial. Totals are the only ones you can look at directly during the totality phase and where everything goes dark, cold and eirie. Really worth the experience.